Automotive Power Transmission Systems Yi Zhang and Chris Mi, University of Michigan-Dearborn, USA Provides technical details and developments for all automotive power transmission systems The transmission system of an automotive vehicle is the key to the dynamic performance, drivability and comfort, and fuel economy. Modern advanced transmission systems are the combination of mechanical, electrical and electronic subsystems. The development of transmission products requires the synergy of multi-disciplinary expertise in mechanical engineering, electrical engineering, and electronic and software engineering. Automotive Power Transmission Systems comprehensively covers various types of power transmission systems of ground vehicles, including conventional automobiles driven by internal combustion engines, and electric and hybrid vehicles. 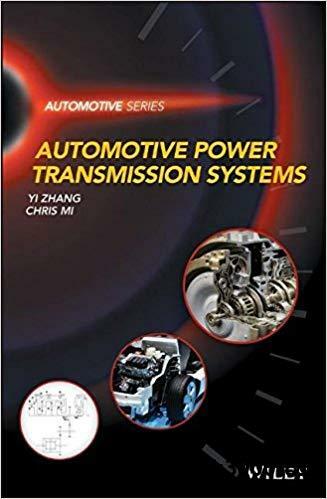 The book covers the technical aspects of design, analysis and control for manual transmissions, automatic transmission, CVTs, dual clutch transmissions, electric drives, and hybrid power systems. It not only presents the technical details of key transmission components, but also covers the system integration for dynamic analysis and control. Key features: * Covers conventional automobiles as well as electric and hybrid vehicles. * Covers aspects of design, analysis and control. * Includes the most recent developments in the field of automotive power transmission systems. The book is essential reading for researchers and practitioners in automotive, mechanical and electrical engineering.